Alina Gonzalez practices in the Personal Injury and Criminal Defense Department. She earned her Juris Doctor Degree from the University of Miami School of Law. While in law school, Alina served as a Judicial Intern for the Honorable Judge Martin Zilber of the 11th Judicial Circuit Court for the State of Florida. In 2016, Alina was elected as Editor-in-Chief of the International and Comparative Law Review of the University of Miami School of Law. 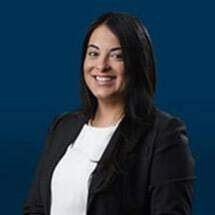 She attended Florida International University, where she obtained her Bachelor of Arts Degree and served as Student Body Vice-President t for the Student Government Association. Since graduating from law school, her primary area of practice has been personal injury law and criminal defense. Alina is admitted to practice in the State of Florida and in the United States District Court for the Southern District of Florida.